This philosophy is especially true when it comes to the shoeing of horses. I don’t like to be the bearer of bad tidings, but it seems apparent that things are getting worse. I have always stressed the importance of trimming the hoof to achieve a symmetrical shape. This can be and must be done no matter what the size of the hoof. By doing this you will help the horse move in a natural, even and uninhibited way. If the hoof is out of balance in any way, the flight of the leg will be crooked and uneven. 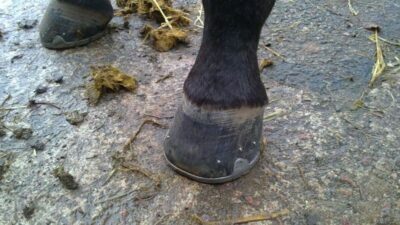 Probably the most common error in hoof preparation is simply not trimming out the sole enough. This leads to what we know as the low heel/long toe type of hoof. It is not always easy to remove the sometimes rock hard overgrowth of six week old sole, but unless you do, the hoof will end up too long in the toes and his action will change for the worse. A couple of very predictable things happen because of this shortcut – the shoe has to be lengthened to fit the longer hoof, or the toes get dumped after the shoe is fitted. The outcome is then predictable – the horse starts to overreach and pull off his front shoes or to scalp his heels or he starts to trip and stumble. The second shortcut remedy is then applied – squaring off the shoes in front to make his hoof take off quicker and to stop pulling off shoes. This is WRONG! Now the horse starts to feel bumble-footed. If you want to really understand why, try this: just walk along normally until you are comfortable, then scrunch up your toes and break into a trot then a canter. Now perhaps you can see why the horse feels so uncomfortable. You found it impossible to stride out, your steps became higher and much shorter, and I guess you didn’t trot or canter very far, either. Squared toe or rolled toe shoes have their legitimate place of application in the treatment of some lameness problems, but should not be used as a bandaid to fix over-reaching. The real cause begins back at the hoof preparation and trimming stage of shoeing. Our ground and weather conditions here in Australia vary to the extreme. When it is dry and hard in the summer, we just have to work harder to get the correct balance in the hoof. The horse’s hoof is really the same as it always was – do you realise that the shape of the ideal hoof capsule at the coronary band should be the same shape at the ground bearing surface of the hoof wall. I have never seen a horse that has square shaped coronary bands in front. Even the horses that I have seen with man-made square toes and which had gait problems have been able to be corrected just by using hard work, good hand tools and good standard shaped shoes which are light enough to allow the horse to complete his task.